Bohlman’s new book presents us with a historiography of identity construction in modern Jewish music history. It culminates a trilogy that traces the history of music in Jewish communities worldwide. The first, The Land Where Two Streams Flow (1989) begins in Israel at the end of the twentieth century. The second, The World Centre for Jewish Music in Palestine (1992), focuses on the transition from Europe to Palestine during and after the Holocaust . Jewish Music and Modernity (2008), which completes the trilogy, traces the musical life of various Jewish communities in Europe spanning from the eighteenth-century Haskalah—the Jewish form of Enlightenment—until the Holocaust. Thus, the trilogy presents an interesting chronological inversion, one that implicitly raises one of the many historiographical issues that the present book explicitly challenges. 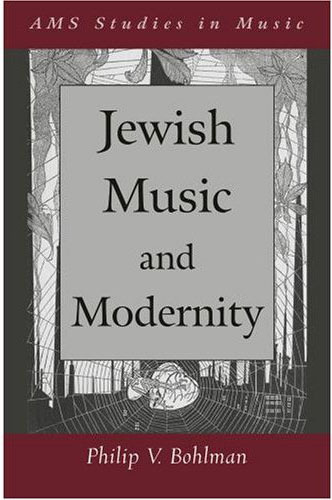 Rather than constructing a trajectory of Jewish musical history along a route that begins in the (timeless, authentic) Eastern Mediterranean and that ends (in historically corrupted form) in Europe with the Holocaust (36-7), Bohlman argues for a much more nuanced and dynamic approach to understanding Jewish music in modernity. And, by situating the search for “Jewish music” in modern historical discourses, Bohlman reveals the pursuit of “authenticity” as a result of modernity’s challenge to Jewish musical identity. Musically speaking, such challenges include the introduction of instruments, women’s voices, polyphony, and modern secular vernacular languages in liturgical practices (75). In each of the three volumes, as in each chapter of this book, Bohlman navigates a musical landscape of transition, conflict, and confluence, past and present. Hence his primary focus, in the present volume, on various border regions of Central and Eastern Europe, from where a great variety of musical traditions emerge. Over the course of nine chapters, divided equally among three main parts, Bohlman explores musical territory that has remained invisible in Jewish music scholarship precisely because of its geographical and political “in-betweenness” (3). He begins his journey in Jewish villages of Central and Eastern Europe; that is, not at the center of the modern city, but at the periphery, where Jews found refuge from cities in times of adversity, and where the exchange between Jews and non-Jews became audible in folk music (ch. 1). His journey ends on the musical stage in the modern city, a liminal space that attracted the collaboration of Jewish and non-Jewish artists (from Arnold Schoenberg to Friedrich Holländer), and finally in Terezín, where Jewish artists were interned during the Holocaust. During the course of this history, folk ballads, liturgical music, satirical and political songs, popular songs in various dialects, popular broadsides, cabaret, and opera comprise the musical material on which the author focuses. Bohlman persuasively argues that Jewish music is a hybrid amalgamation of many places, musical and linguistic varieties, and ethnic identities; it is both Jewish and non-Jewish. But Bohlman is not only interested in the products and places of Jewish musical history; he is also interested in the processes behind them – the composers, performers, performance practices, and technologies of written and oral reproduction, to which he devotes equal amount of space. Bohlman’s contribution to the growing field of Jewish music scholarship lies not only in his exploration of original musical material, but also in his highly innovative approach. Combining archival and ethnographic fieldwork with analytical frameworks drawn from both musicology and ethnomusicology, he pieces together fragments from a polyphony of voices, past and present, to provide a rich, indeed dense, and highly nuanced study. For example, the recollections of current inhabitants of former Jewish communities are juxtaposed with explorations of abandoned synagogues, historical and literary narratives, ethnographic records, and folk songs (ch. 1). This fragmented approach both documents the dynamics of negotiation and transition that characterizes Jewish musical history, and underscores the slippage between myth and history, present and past, in Jewish historiography. The book therefore resists an overarching narrative or teleological impulse; rather, disjuncture determines its content and form. Bohlman’s book, then, is just as much about the historical narrative as it is about Jewish music. The fragmented montage of such diverse materials and topics, however, is disorienting, leaving the reader with the arduous task of assembling a whole from its disjointed parts. The reader’s task might be alleviated by a clearer introduction to the subject. Further, some of the more obscure remarks are left unexplained. For example, while we are asked to remember “the metaphysical debates of music’s capacity to represent” and that music “has the power to create a discourse that mixes signifiers and juxtaposes meanings” (69), we are subsequently informed that music “offered a panoply of ways to fix indeterminate meanings” (80), but also that music “makes history because it cannot be reduced to the way it was” (104). Whether or not these assertions about music add up, they deserve fuller elucidation with substantiating references. Indeed, the paucity of detailed references in general seems odd, especially given the interdisciplinary readership that this book demands. For example, while most readers will be relieved that Richard Wagner’s voice does not dominate throughout, it would be helpful to provide bibliographic references to Wagner’s respondents for readers unfamiliar with the Wagner industry (189-191). Similarly, in order to make Jewish musical life more audible (31) the book would benefit from more musical examples and more substantial musical descriptions. These reservations notwithstanding, Bohlman’s meticulously researched book is highly sophisticated in its argument, innovative in its approach, and original in its insights into a wealth of new materials, and as such presents a valuable contribution to scholarship on Jewish music, Jewish history and historiography. See Philip Bohlman, “The Land Where Two Streams Flow”: Music in the German-Jewish Community of Israel (Urbana: University of Illinois Press, 1989); and The World Centre for Jewish Music in Palestine, 1936-1940 (Oxford: Oxford University Press, 1992).